Are you a match for this man-loving moggy? Cats Protection’s Warrington Adoption Centre is seeking a male-only home for a choosy tabby who has shown a distinct preference for men. One-year-old puss Gregorovitch will happily sit on the laps of the men at the centre, sometimes even hugging their legs when they try to leave. “It’s very unusual for us to see a cat with such a distinct preference for either men or women,” explained centre manager, Sonia Scowcroft. “Gregorovitch is a really sweet young cat and loves attention from our male staff and volunteers, but sadly he’s not so fond of the females so we think he’d be best suited to a male-only household where he can be a man’s best friend. “He’s a lively cat and can become quite frustrated with his current lack of freedom, so we’d like to find him his ideal home as soon as possible, preferably with plenty of outdoor space where he can burn off some of his excess energy. Due to his quirky nature, Gregorovitch would best suit a home with an experienced cat-owner and no children. 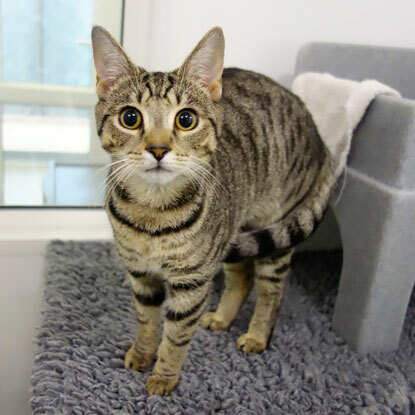 If you live in the North West and are interested in offering Gregorovitch a home, you can contact Cats Protection’s Warrington Adoption Centre on 03000 120612 or pop in and meet him. The centre is open every day 11am-3pm, except for Tuesdays, with late opening on Thursdays until 7pm.